What can I say about sisters? We’re similar in some ways but we’re also completely different in others. We argue, we fight, we laugh, and we cry. Even if we’re full grown women, when we get together we’re like kids again. And even if we annoy each other or live thousands of miles apart, when one of us is sick or hurting, we worry and try to support each other the best we can. Although we might have nothing in common, we love each other. Why? We may have specific reasons or examples but usually it’s love without rationale, distinct from the way we love a friend (and sometimes friends are as much of our sisters as our siblings) or our significant other. Whether it’s because we’re connected by DNA or by a shared childhood, this sisterly bond sometimes feels like a mystery to me! So to celebrate this mystery, this connection and love, I’m sharing my favorite examples of positive sisterhoods in pop culture. 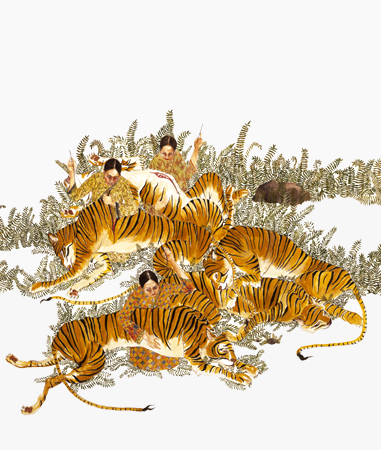 When a young woman is asked to use her sewing skills to help mend tigers whose backs have split open, her sister, somewhat aimless in life and protective of her older sibling, follows her into deep Malaysia. Each sister is transformed through this experience in her own way. Incredible writing by one of my favorite authors. Aimee Bender has stated that she was inspired by Amy Cutler’s painting Tiger Mending (picture shown, 2003). The story has been published in Bender’s collection The Color Master and in The Best American Non-Required Reading 2005. It was originally published in Black Book, #34, Fall 2004. Grammy Award winner Toni Braxton suffers from lupus and sits on the board of directors for LupusLA. In this reality TV show, we get to meet her equally talented sisters Traci, Towanda, Trina, and Tamar and their mother Evelyn. As with every group of sisters, they each have their own strong personality which can lead to disagreements, tension, hilarity, and a lot of singing. I love it when they do something out of their norm, like traveling abroad or joining some crazy new fitness program. I also enjoy watching them do what has always been part of their sisterhood: pajama parties and singing. If you have one sister or five (or a lot of aunts), you need to watch! The show airs on WeTV and past seasons are available on Netflix, Amazon Instant Watch, Hulu. Two sisters against the world! You may already be familiar with Shirley Jackson’s short story “The Lottery,” so expect a strange, disturbing tale. Follow the adventures of Satsuki and her four-year-old sister Mei when they move into a new home in the countryside. 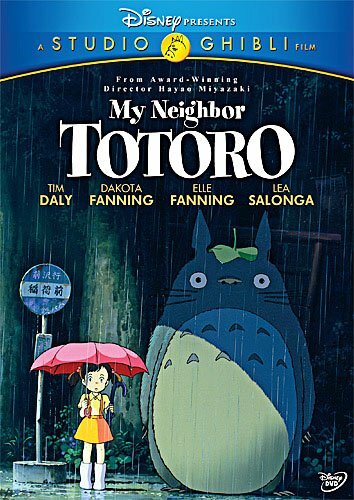 To their delight, they discover that their new neighbor is a mysterious forest spirit called Totoro — who can be seen only through the eyes of a child. Totoro introduces them to extraordinary characters — including a cat that doubles as a bus! — and takes them on an incredible journey. This is my favorite film version of the classic novel by Louisa May Alcott. Although it may not be as faithful an adaptation as the others, it’s the best at capturing how the sisters interact and each grows into her her own person. As readers and viewers, we all connect to at least one of the girls — Margaret, Jo, Beth, or Amy — and we share their joy and sorrow. Even though we may have read the novel as children, it’s still a lovely read. In this version of the movie, the March sisters are played by Janet Leigh as Margaret, June Allyson as Jo, Elizabeth Taylor as Amy, and Margaret O’Brien as Beth. Marmee is played perfectly by Mary Astor. Kim and Kelley Deal. Twins. Women who write their own music, play instruments — what’s not to love? Since her time playing bass in the Pixies, I’m still crushing on Kim Deal.